Does Nissa Steward of Elements +0 ability tap guildgates and lands that enter tapped? Neurosis, manlands and Planeswalkers do the trick. Man lands are my main wincon considering they untap every turn with reclamation.. but i'd also give some love to Nissa, Steward of Elements considering she also makes man lands with flying and it feels good to swing in with 10 damage. So the key here is to get things for cheap due to the stuff in the graveyard. Black might help with this with sacing stuff. I would use cards like Sakura-Tribe Elder It lets you ramp with green, and filters out lands. Its an amazing card. 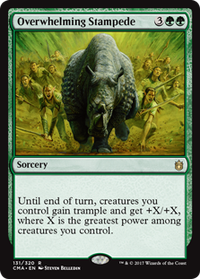 It also ramps by putting another creature in your graveyard, which is also good. Fauna Shaman Will get you the big creatures you want, by tutoring and put creatures you dont want in your graveyard ramping you to get closer to Ghoultree . 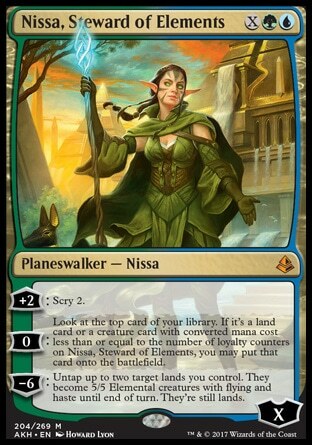 Also there is a UG Nissa which is worth looking at Nissa, Steward of Elements . Honestly the only planeswalkers that are a problem to me are Karn Liberated and Ugin, the Spirit Dragon because of tron, Liliana of the Veil , and maybe Teferi, Hero of Dominaria for standard. 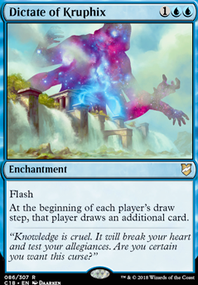 Jace, the Mind Sculptor is neat, but he was only so busted before because there was almost no removal for planeswalkers. 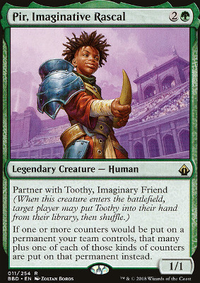 Without all that much miracles support in modern, Teferi is just better in many ways. 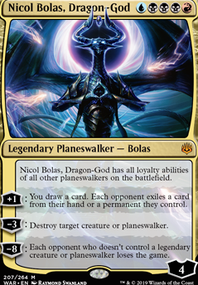 Nicol Bolas, Planeswalker is way too hard to cast to be a real promblem. Still, I would definitely like to see much more diversity in the Planeswalker designs. I like the ones where you can ult immediately, but it's not really a busted ability, like Karn, Scion of Urza or Liliana, Untouched By Death . More planeswalkers like Nissa, Steward of Elements with X in their cost would be nice too. i was playin a sultai elf brew at modern fnm one time, and my best match that night was against tron. the funniest part of that match was game 3. i'd sideboarded in Damping Sphere and Negate . i'm on the play, and slam a Damping Sphere turn 2. my opponent is left doing nothing meaningful for a while. my draws weren't great, but i build up my army of elves over a few turns. i've got a Negate in hand, and on my opponents turn 6, he uses all 6 lands to play Wurmcoil Engine . so Negate continues to sit in my hand useless. i continue building up my elf army, courtesy of Nissa, Steward of Elements . on my opponents next turn, he plays another Wurmcoil Engine . he doesn't attack because i can block and regenerate (and also threaten a win) with Ezuri, Renegade Leader . on his next turn...a 3rd Wurmcoil Engine . at this point im getting frustrated because i want to Negate something. he still doesn't attack. his next turn... Ugin, the Spirit Dragon . oh heck no. i Negate the bejesus out of it. he still doesn't attack. now its my turn. i draw an Elvish Champion for the win because he controls a Forest . Might be a little payoff dense? You have 6 big green lads, 4 pacts, 4 payoff walkers. 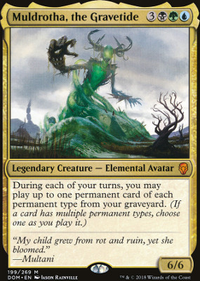 And also... Prophet of Kruphix , because you are a crazy person, which I respect, but also fear for you. Which is, I gotta tell you, a bad look. 15 is probs a lil high. And that's not even including the Frilled Mystic who also quite chonky. This chonk goes too far, that's 17 chonk. And that doesn't even touch on whether UU is reasonably castable for you. More 2 and 3 drops! Rhox War Monk might be a reasonable takeaway from blue, as might Coiling Oracle ? If we're just brainstorming the U side of things. Wistful Selkie does intense devotion. And then on the chonk side, Tamiyo, Field Researcher opens up as a cute option, or Nissa, Steward of Elements . Big Update: Added in some cards that I already had. Took out some cards I felt didn't contribute enough to the +1/+1 counters, or I had cards which did what the card did, but better. Also adding in both Nissa and Champion of Rhonas may allow me to cheat out some of my more expensive spells, saving mana for adapting those already on the field.